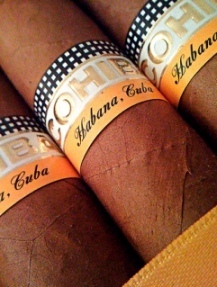 1) Companies selling to the U.S. market haven’t been shy about naming their products after outlawed Cuban brands. Case in point: many of the lines made by General Cigar and Altadis. But as relations between Washington and the communist island nation slowly improve, trademark disputes in this gray area of the law are likely to intensify. The Associated Press sheds some light on what might ensue should America lift its half-century trade embargo on Cuba. 2) Officials in St. Louis recently announced that a county-wide proposal to ban indoor smoking will be on the ballot in November. The American Cancer Society and other anti-tobacco groups, however, were angered because they had hoped to pass a stronger, exemption-free law through the legislative process instead of via voter referendum. Meanwhile, in Kansas, Gov. Mark Parkinson indicated his desire to push for a statewide ban and increased tobacco taxes in 2010. 3) Inside the Industry: West Coast cigar enthusiasts should consider attending Cigar Con West, which takes place in Paso Robles, California, September 18-19. The event will feature many top cigar makers and over 250 winemakers. 4) Around the Blogs: Keepers of the Flame lights up a Romeo y Julieta Habana Reserve. Stogie Review reviews a Casa Magna Colorado. Cigar Inspector inspects a CAO Gold Vintage. Stogie Spy investigates the Gurkha Triple Ligero. 5) Deal of the Week: Toro is one of most popular vitolas around, and this “Stellar Toro Sampler” contains some fine examples of the format. For just $40 (free shipping) you get 10 toros including smokes from Toraño, Don Pepin Garcia, Rocky Patel, Perdomo, Partagas, and La Aroma de Cuba. Grab yours here.